Chalet Primerose is a lovely traditional alpine chalet sleeping up to 12 guests, perfect for families or friends. This chalet is in a central Chamonix location with south facing panoramic views of Mont Blanc, Glacier des Bossons and the Aiguille du Midi. Chalet Primerose is 140 m2 in private surrounding and has 6 bedrooms sleeping up to 12 people. 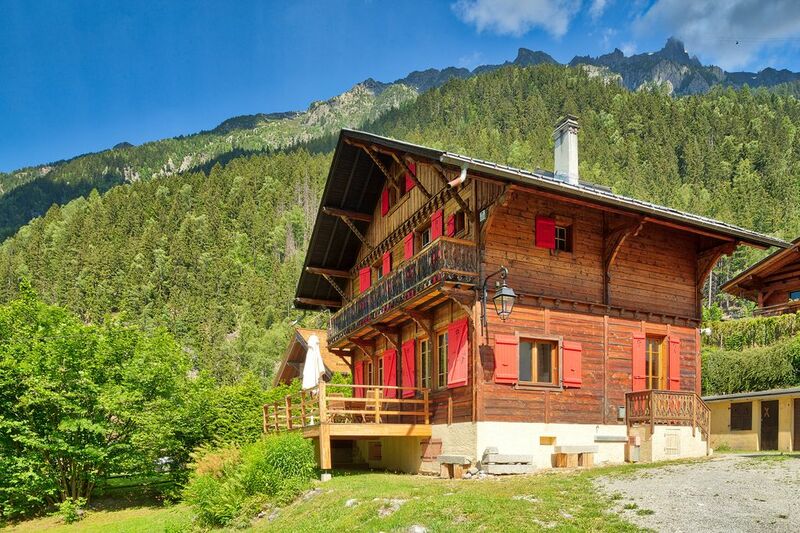 It is located within 800m from the centre of Chamonix and is a short walk or drive to Le Brevent ski area and also very close to the rock climbing wall at Les Gaillands from summer. This free standing chalet is built over three levels plus basement. On the ground floor there is an entrance hall, WC, lounge, dining area and a kitchen (washing machine, dishwasher, oven, microwave, fridge/freezer) as well as a French raclette machine. The1st floor comprises of 4 bedrooms: 2 double bedrooms, 1 twin room & 1 bunk bedroom sleeping up to 8 guests. The double rooms share a shower room and each has it's own basin and entrance. There is also a bathroom with a bath & overhead shower and WC. On the 2nd floor there are 2 bedrooms: 1 bedroom with a 1 single bed & the second with 3 single beds, sleeping 4 guests. On this level there is a shower room & a WC. For your comfort in the living room there is a television, DVD player, Internet access. The cellar has table tennis and a great space for sporting equipment. There is an outside garage with parking for 1 car as well as further outdoor parking, a ski room, garden furniture and barbecue for the summer. On the First floor has a full bathroom with bath/shower, sink and WC. Between the two double bedrooms on the first floor there is a shower room. On the Second floor there is a shower room with sink and WC. Included are Linen and Towels for standard rental period (1 week) Charges may apply for other periods of rental, please enquire. Subject to availability we can provide high chairs when requested. A daily house-keeping service is available at an additional charge. Our Concierge Partners 'Chamserve' offer all our guests; Guests to be met at the property and to receive a Welcome Pack. A representative of Chamserve will be available in Chamonix to answer any questions you may have regarding the accommodation, the resort, where to eat, etc. Also they will help you with any unfortunate emergencies that may arise personally or with your accommodation. We are also able to help you pre-order and purchase ski lift passes, equipment hire, lessons and guides as well as arrange transfers for you. On arrival you can choose from a 'luxury' hamper to a 'bare essentials'. If you arrive late and want milk, bread, etc, on hand, again we can ensure this is in place when you arrive. Normal check in is between 4pm and 8pm, and check out on departure by 10am. The chalet is very spacious with ample parking. It sleeps 12 comfortably and even has a games room on the basement level. The living area has plenty of seating for everyone. It is within an easy walk to Chamonix town centre and only a short walk to the bus stop. A great chalet for friends or extended family sharing. Thank you for the lovely review of Chalet Primerose, we are delighted you had a great time during your stay with us and we would love to see you back again. Our recommendation is that you fly to Geneva airport it is only 50 miles (80km) to Chamonix and takes little more than an hour. You may choose to hire a car or we can arrange a transfer for you. You may choose to travel by train or public bus from the airport although the journey takes much longer. Chamonix is best known for its extreme skiing, climbing, high mountain hiking and mountain biking. This busy alpine village is extremely popular in the winter and summer seasons with tourists clambering for a glimpse of Mont Blanc. Chamonix has all the facilities of a town with a great variety of shops, restaurants and bars, cinema, museums, sports centre, ice-skating, tennis, squash, swimming pools and 18 hole golf course. There are fabulous walking and running trails all over the valley as well as xc mountain biking and down hilling and unlimited climbing areas for all abilities. The skiing/snowboarding is ideal for intermediate and advanced skiers, but also great ski schools for beginners. Golf: The par 72 golf course is overlooked by some of the highest peaks in the Alps and is next to the Felgere Ski Resort. If you are staying in Chamonix it is a 5min drive or you can take the train or a bus to Les Praz. The golf course in the Chamonix valley has a high standard with excellent facilities. It is situated next to the village of Les Praz. Constructed in 1934, originally with 4 holes, it was officially opened on the 20 July 1935 with 9 holes completed. It was only in 1972 the council decided on a further 9 holes. So 10 years later, on the 26 September 1982 it was relaunched with 18 holes. A technical course designed by the prestigious architect Robert Trent Jones Senior, who knew how to make the most of the environment. The course is notable for the its numerous obstacles and raised greens. There is a driving range of 29 bays of which 14 are covered, 2 training greens and 2 bunkers. Course open every day, reservations 24 hours in advance. Route du Golf, Les Praz, 74400 Chamonix Mont-Blanc. Ski: Chamonix provides skiing for all abilities with nursery slopes at Les Planards, Les Chosalets as well great ski schools at all the ski resorts. However, Chamonix is ideal for the intermediate and advanced skier. The intermediate runs boast excellent groomed pistes, trails and mogul fields. For the expert skier there is limitless off piste skiing and some of the steepest and most challenging runs in the Alps including the awe-inspiring 22km ski down the Vallée Blanche on the Mer de Glace with a mountain guide. The skiing in the Chamonix Valley is spread over 5 separate areas which are linked by a regular and efficient bus service included in the lift pass. At the base of the Valley is Les Houches. From the Chamonix centre Le Brévent which is linked to La Flégère. Up the Valley is Les Grands Montets at Argentière and finally Le Tour. The Chalet is available for weekly rentals. Our standard period of rental is 7 nights from Saturday to Saturday although we will consider other dates and lengths of stay. Price based on standard capacity of 12 persons occupying this property. Subject to additional charge of £100 per person for more persons. - What’s included: Exclusive use of this property and its facilities. Linen and Towels for standard rental period, charges may apply for other periods of rental, please enquire. Utility charges and your end of stay clean. - What’s not included: Tourist tax of £1 per person (13 years and above) per day, payable with the booking. EXTRAS (subject to additional charge) Travel cot £15, highchair £15, camp beds £65 Food hampers, please enquire for details Daily / mid-stay housekeeping, please enquire for details.